A drug-troubled offender used a stolen debit card to buy goods after it had been stolen by someone else from a parked car. 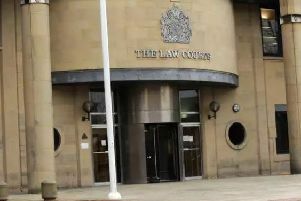 Chesterfield magistrates’ court heard on September 26 how Shaun Patrick Morrisey, 35, was handed the card by the other offender and he used it to buy goods from shops. Mrs Bickley added the card was subsequently used by Morrisey and the amount of the transactions came to £33.70. The victim contacted a store and viewed CCTV footage, according to Mrs Bickley, and Morrisey was recognised. Police found the card in jeans at his home. Morrisey explained he had been with another male and had gone to the toilet and when he returned the other male had stolen the handbag, but Morrisey accepted he had used the bank card. The defendant pleaded guilty to handling stolen goods from November 10 last year, and to committing fraud between November 10 and 14 last year, by using the stolen debit card on Market Street, New Mills, to buy goods. Steve Brint, defending, explained the case had been delayed because correspondence had been sent to Morrisey’s former address. Mr Brint added Morrisey had a prolific criminal record after he had been introduced to drugs and he became addicted to heroin which led to offending. Morrisey was not involved in the theft, according to Mr Brint, but he had used the stolen debit card to buy tobacco, alcohol, biscuits and food. Mr Brint added Morrisey showed police where the handbag had been dumped. He added Morrisey, of Hill Street, Dukinfield, has not been using heroin for a considerable time and has not committed any new offences. Magistrates fined Morrisey £120 and he must pay a £30 victim surcharge, £85 costs and £33.70 in compensation.